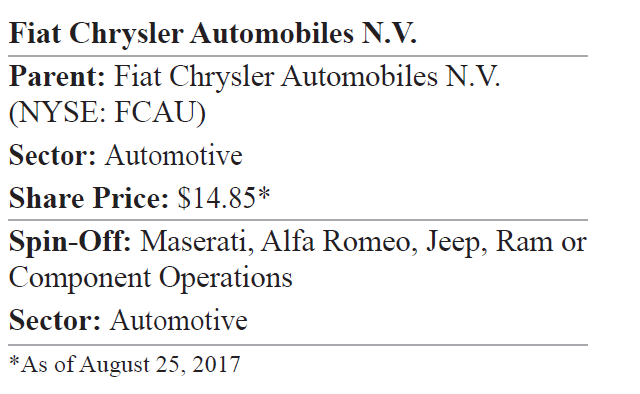 On August 22, 2017, market speculation was rife that Fiat Chrysler Automobiles N.V. (NYSE: FCAU, $14.85, Market Capitalization $22.8 billion), a global manufacturer and marketer of automobiles and commercial vehicles, might spin-off upscale brands Maserati and Alfa Romeo, along with its components operations including Magneti Marelli. In April 2017, in response to an analyst query on the 1Q17 earnings call, Mr. Sergio Marchionne, Chief Executive Officer (CEO) of FCAU acknowledged that the Jeep and Ram brands are large and strong enough to exist as independent entities, similar to Ferrari after its spin-off. Post spin-off, Maserati will continue to design, engineering, develop, manufacture, globally distribute and sale luxury vehicles under its brand. On the other hand, Fiat Chrysler will continue to manufacture and mass-market automobiles and commercial vehicles in the regions NAFTA, LATAM, APAC and EMEA under the brands Abarth, Chrysler, Dodge, Fiat, Fiat Professional and Lancia brands. 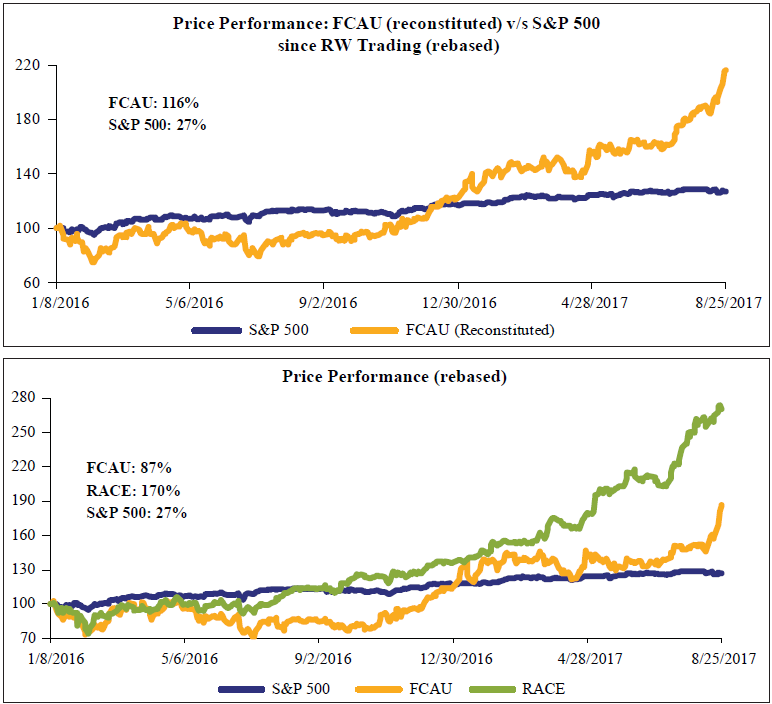 FCAU shares have increased 18% in the last two weeks and surged 10% since the rumors of spin-off of Maserati and Alfa Romeo brands surfaced. The spin-off speculation followed immediately after Chinese automobile manufacturer Great Wall Motors confirmed its intention to buy the iconic Jeep brand. FCAU denied the news stating that it has not been approached by the automaker for Jeep brand or any other matter related to its business. According to reports, a final decision might be taken in early 2018, although Fiat Chrysler has not set any timeline and is yet to divulge any concrete details on any potential transaction. Management said that they are focused on enhancing shareholder value and will continue to evaluate all ideas that have the potential to achieve their goals. Based on news reports, FCAU was in talks with various parties regarding the sale of Magneti Marelli in 2016, although negotiations were unsuccessful. We believe CEO Sergio Marchionne may be looking at transforming Fiat Chrysler as he steadily nears the end of his term in 2019. In the past few months, Mr. Marchionne has tried to champion a merger of Fiat Chrysler with larger rivals including General Motors and Volkswagen, although he has been rebuffed by both auto majors. Since a long time, Mr. Marchionne has persuaded automakers for further industry consolidation to more efficiently utilize research dollars for development of new technologies including cleaner fuel. Moreover, Mr. Marchionne is seemingly weary of the company’s ability to survive the industry transition to electric cars and autonomous vehicles. According to news reports, Fiat Chrysler may be considering options to spinoff its upscale brands in a bid to focus on mass-market cars. Consequently, a leaner and focused Fiat Chrysler may be able to garner more attention from larger rivals for consolidation. On the other hand, Fiat Chrysler aims to be net industrial debt positive by the end of 2018 (net industrial debt stood at €4.2 billion at the end of 2Q17). 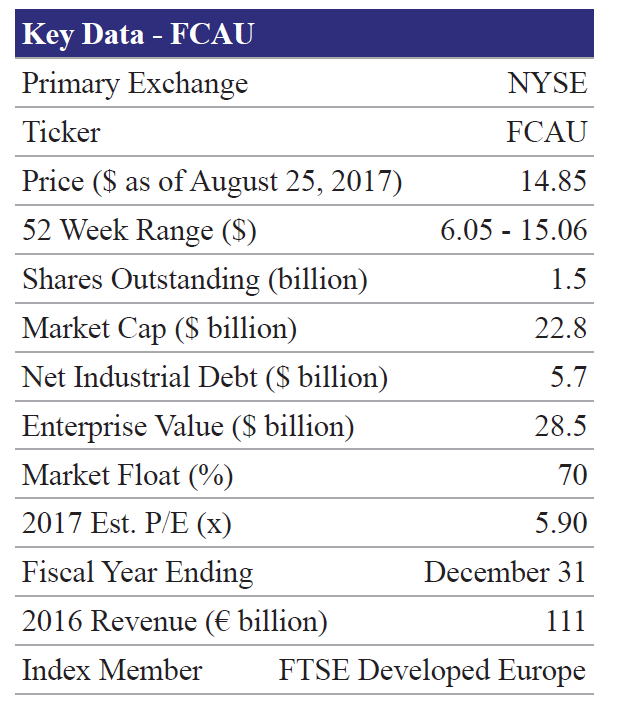 To put things in perspective, the IPO and spin-off of Ferrari had positively impacted Fiat Chrysler’s net industrial debt by €1.5 billion. Mr. Marchionne’s variable compensation depends on the achievement of annual financial targets which include profitability and debt measures. Hence, we think Fiat Chrysler may again weigh options to sell or spin-off some of its brands to garner high valuation, thereby lowering its debt. Besides, lower debt may pave the way for Fiat Chrysler’s consolidation with other auto players. A potential spin-off could enable the Agnelli family and other shareholders of Fiat Chrysler to unlock value, which is undervalued relative to its peers. Fiat Chrysler’s management may be tempted to replicate the tremendous shareholder value creation achieved through the separation of luxury car-maker, Ferrari N.V. In August 2017, some analysts contended that the value of all of Fiat Chrysler’s business units, including Maserati could be almost thrice the company’s then market capitalization of ~$22 billion. Some analysts estimate the luxury brands could be valued up to €7.0 billion ($8.3 billion), while Magneti Marelli and other parts units could fetch up to €5.0 billion. For the iconic Jeep brand, the rumored spin-off or interest shown by Chinese automaker Great Wall could offer opportunities to unlock shareholder value or to lower leverage. Jeep is one of the most profitable brands at Fiat Chrysler and the largest selling SUV brand in the world. The brand’s strong US distribution network makes it an attractive proposition for car makers seeking an entry into the US market. Analysts value Jeep in a range of €12.0-€17.0 billion (close to $14.0-$20.0 billion). Even post the separation of Ferrari, key brands such as Jeep, Maserati and Alfa Romeo have partially cushioned the impact of the top-line reduction in NAFTA region and led the margin improvement at Fiat Chrysler. As an example, in 2Q17 higher shipments of the new Levante saw Maserati (shipments: +91% YOY, revenue: +85% YOY) outperform all other segments, while robust operating leverage led to the fourth consecutive quarter of double-digit margins at the unit. Also, Jeep led to 43% rise in combined shipments in APAC, while Alfa Romeo was launched in China. In conclusion, we believe that spin-off of major brands may leave Fiat Chrysler devoid of earnings catalysts in the future, which could prove to be a risky strategy. On January 3, 2016, Fiat Chrysler completed the tax-free spin-off of the remaining 80% of Ferrari (NYSE: RACE, $114.00; Market Capitalization $21.5 billion). FCAU and RACE commenced regular-way trading on January 8, 2016. The spin-off ratio was 1:10, implying that each FCAU shareholder received one RACE share for every 10 shares of FCAU held as of the record date January 5, 2016. Based on this ratio, Fiat delivered 0.77369 shares of Ferrari to holders of the mandatory convertible securities for each $100 in outstanding mandatory convertible securities. Post spin-off, Ferrari shares also commenced trading on the Milan Stock Exchange. Earlier October 21, 2015, Fiat completed the carve-out of 10% of Ferrari. On the same day, Ferrari commenced trading on the NYSE under the symbol RACE. On October 20, 2015, pricing for the IPO was announced at the higher end of its previously announced price range of $48.00-$52.00 per share. At the IPO price of $52.00 per share and post the exercise of over-allotment, Fiat raised gross proceeds of $982 million. Just after Fiat Chrysler spun off its luxury sports brand Ferrari N.V., the companies had a combined market capitalization of $18.1 billion on January 8, 2016. Currently, the individual market capitalization for both Fiat Chrysler ($22.8 billion) and Ferrari ($21.5 billion) has surpassed the combined market capitalization at regular-way trading, leading to stellar returns to investors. In May 2017, Ferrari’s strong 1Q17 results and reiterated guidance led to a surge in the stock price (shipments: +6% YOY, revenue: +22% YOY, adjusted EBIT: +46% YOY). The company followed up with another robust financial performance in 2Q17 as well. Ferrari, which is exclusively focused on luxury and sports cars, has witnessed consistently strong results and margin expansion, although the company has just maintained its outlook for full-year 2017 after each of the first two quarters of 2017. Interestingly, in August 2017, the company confirmed its plan for utility vehicle and hybrid sports cars, with reports stating that the company may aim to double its profit by 2022.